7.12 points at 17 votes (rank 323). 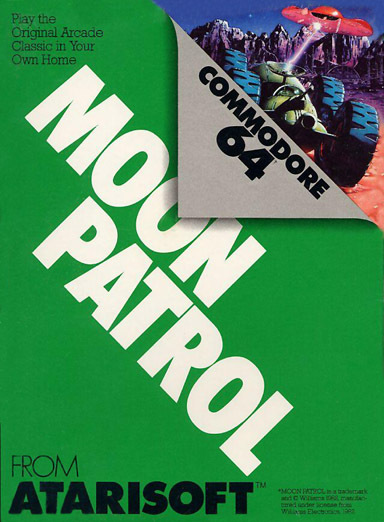 The game Moon Patrol is about a patrol drive on the moon with the help of a corresponding vehicle that can jump and shoot. On the way to the checkpoints (A to Z) there are not only holes and stones disturbing the patrol path, but also UFOs and spaceships, that in addition drop missiles and bombs. If the drive to the next checkpoint (E, J, O, T, Z) is done within a certain time, you get awarded bonus points. This genre was rather popular at the beginning of the 80s and different variations were published. 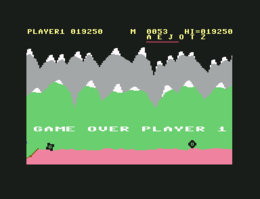 Very rudimentary conversion of the arcade machine with utterly simple but clean scrolling graphics from left to right. 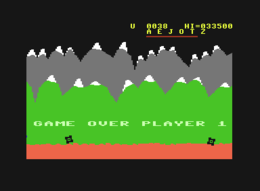 The collision query is a little on the unprecise side, so that jumping over obstacles needs training. There are background music and FX. The further to the right you drive, the later you will notice an obstacle, but if you drive to the leftmost, you will not be able to react to a hostile vehicle coming from behind. Try to jump over two craters closely next to each other with one jump. Some UFOs throw bombs that create new crates. If a hostile vehicle appears from behind, jump over it and then shoot it. Robotron2084: "Oh, look: The moon car has square wheels! No wonder, that it likes to clash into numerous crates. Maybe this could be also the fault of the the very picky collision query, or the latent oversize of the sprites compared to the original. On the other hand hits from the own laser cannons are sometimes "just simply" ignored - you see: poetic (in)justice. I do not really like this proposition by Atarisoft, furthermore, the lumpen graphics are compared to the original really TOO bad. The mountains in the background almost make you laugh (or cry!) involuntarily. God knows that they have not put much effort into this. Therefore: a just acceptable version: 5 out of 10 points." Shakermaker303: "Rather miserable, you do not have to know this." Rockford: "Everyone who - same as me - has played the arcade machine version often and liked it, can only be disappointed here. The bad collision query was already mentioned. The fact, that my vehicle explodes a few meters in front of the crater - but not always - does not make it better. 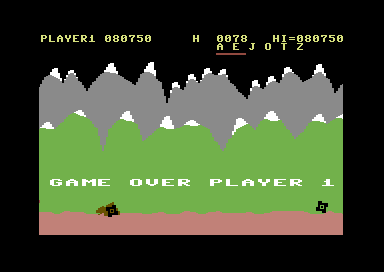 If I remember right, one could shoot the small mines on the arcade machine. I couldn't make it in this version. The mountains ... snow-covered. On the moon. Gnhnhn. I agree with the 5 points." 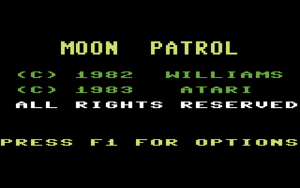 Moon Patrol in the Killer List Of Videogames. This page was last modified on 29 June 2018, at 23:55.